With a recent upgrade to one of our software’s we needed to update to a newer version of Java. In particular Java 1.7_67. 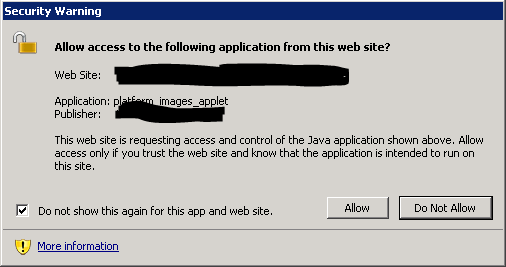 It was quickly brought to my attention that users would be prompted for the Java security warning every time they logged into the application. So, clearly it wasn’t saving the setting that stored the “never ask again” settings. After a huge amount of googling I found a lot of information, but nothing ever pointed me at this new location. (note: after I found the location on my own and did a google search of appdatalocallowsunjavadeploymentcache6.0 I got THIS site in my results, unfortunately I had already essentially resolved the problem at that point in order to know to google that… DOH). We’re using Citrix XenApp 6.5 with Profile Manager. Of course we’ve set our profiles up so that they do not store junk temp data located in AppDataLocalLow or AppDataLocal locations (after all that is the purpose of AppDataRoaming, if it’s important store it there). So, I immediately assumed that Oracle must be storing something in those locations when they should be in Roaming in order for the settings to be retained. After some trial and error I had my answer as to the location of the files in question. 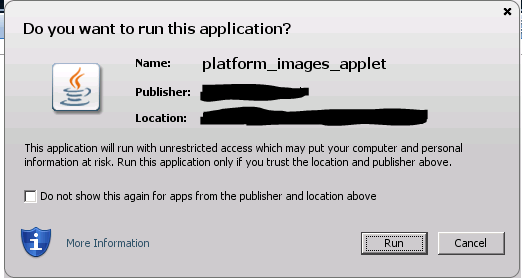 Both files must be retained to save the “Do not show this again for apps from the publisher and location above” and also “Do not show this again for this app and web site” options.